Could you fly a Harrier jump jet? Discover the surprising similarities between flying a fast jet and a glider and find out why the Italian Air Force insists that its pilots learn to glide in the June/July issue of S&G. You can also read about how dehydration canmess up a good soaring flight, and how technology can support effective lookout. Andy Jessett did not have to be asked twice when given the opportunity to swap his beloved Ventus 2cT for a Harrier jump jet for a day and make his first vertical carrier landing (apparently more people have gone into space than have the chance to do that). Not usually one to fly power, Andy was surprised at the similarities he discovered and was left with a grin that just might have to be surgically removed. The Italian Air Force Gliding Centre has a new commander. 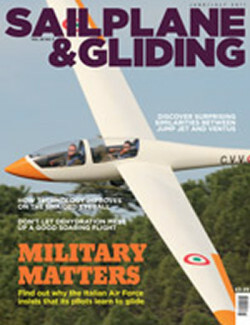 Major Filippo Zuffada (pictured on the front cover) is a highly skilled glider pilot, who wants to combine his vast gliding experience with fresh ideas for the benefit of instructors and students. 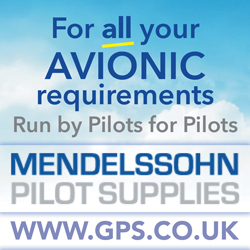 With conditions right for a good soaring flight, the last thing you need is to mess it up through dehydration. Nick McCloud discovered the significance of the ‘I’M SAFE’ slogan the hard way and shares his experience with us. On a good soaring day others will, no doubt, join you. 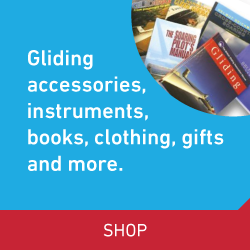 With most glider collisions happening close to the home gliding site, Chris Nicholas offers a personal viewpoint on technology that can support effective lookout. Also in this issue: BGA Chairman Patrick Naegeli recognises those that have been a source of inspiration to our sport, including two gliding greats – Chris Wills and Nick Goodhart – who have moved on to the big thermal in the sky. Michael Powell asks ‘is your airfield protected?’. S&G reports on the highlights of AERO 2011. Tim Macfadyen takes us through the differences between variousASW 20 models. Darren Smith remembers how he left his comfort zone and got into trouble during his first competition. Hugh Browning reports on the success of the BGA safe winch launch initiative over the past five years. Bruce Marshall looks back at theearly days of soaring in Scotland. Ian Strachan reflects on the introduction of handicapping in the UK – probably the first nation to adopt a scientific approach. VGC secretary Bruce Stephenson describes how vintage gliding still holds the flicker of innocence. We’ve more truly stunning images in the Gallery pages. And last, but not least, there’s the BGA club annual statistics.